European Redwood Pine Timber from Stock. Our stock of Planed Pine Timber is produced mainly from 5th Scandinavian Redwood, Board Stocks and Unsorted Joinery Grade Timber. This stock is Kiln Dried to approx 13% moisture content. As well as PSE or PAR sections we keep a number of different moulding profiles including Skirting, Architraves, Dado Rails, Picture Rails, Shiplap Cladding and Handrails. We offer machining services for timber using a Spindle Moulder, Planer Thicknesser and Sliding Table Saw in order to modify dimensions of the standard stock to suit special size requirements. We are also pleased to quote on bespoke machining in both softwood and hardwoods. Please enquire or send in a drawing with details of the shape or section & quantity needed. Stair Rails, Handrails, Door Linings, Doorstops, Fire Check Doorstops. NOTE: : ALL PLANED SIZES ARE STATED AS THE FULL SIZE FROM WHICH THEY WERE MACHINED - THE ACTUAL FINISHED SIZE IS SMALLER OR NOMINAL. TO 3MM FROM EACH FACE MACHINED. THE ACTUAL FINISHED SIZE IS SMALLER OR NOMINAL. 2.5MM TO 3MM FROM EACH FACE MACHINED. 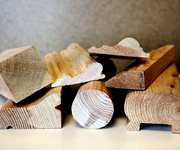 In addition to the wide range of PSE, PAR & Moulded sections we stock small wood mouldings (2.4m lengths) made from Lightweight Hardwood, Dark Red Hardwood and Pine. These cover a variety of needs for decorative panel mouldings and trim detail. In the range Dowels, PSE, Half Round, "D" Shape, Beaded, Scotia, Hockey Stick, Glazing Beads (Std & Fire Check) and other useful lippings.